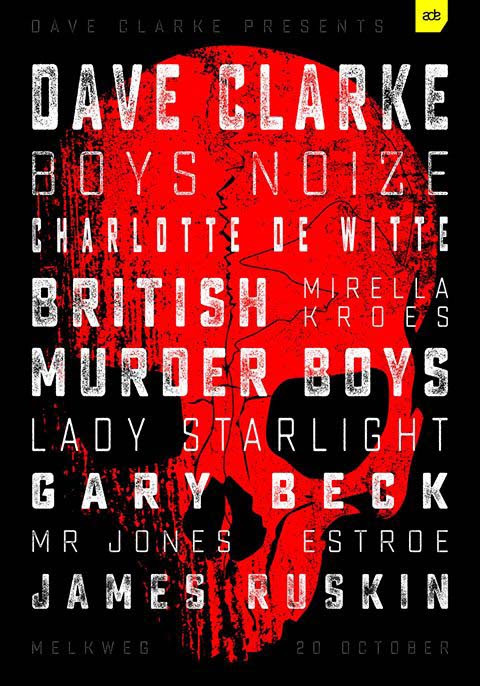 ADE has somehow managed to get even more exciting with the announcement of the ‘Dave Clarke presents’ stage in Melkweg on the 20th of October. Headlined by Clarke himself, he’ll be joined by an onslaught of heavyweights within the genre such as Boys Noise, Charlotte De Witte, Lady Starlight, Gary Beck and James Ruskin. The most notable announcement may be the comeback of Regis and Surgeon under their renowned British Murder Boys alias. Clarke himself is fresh off his three hour set in Index, followed by an impromptu Electro set in Pyg the following day and is sure to deliver come October time. While the stage was always sure to deliver the finest techno acts, the inclusion of multiple Dutch DJs is a positive sign for the indigenous scene there with names like; Estroe, De Witte, Mr. Jones and Mirella Kroes all on the bill. The lineup as a whole is impressively peppered with DJs of entirely varying styles; from Boys Noize’s Electro-sound, BMB and Ruskin’s more frantic noise to Gary Beck’s kick-heavy tracks. ADE as always covers all grounds of a festival, coupling great electronic music with compelling performances, making it easy to pair live acts like Lady Starlight with the most pulsating Techno DJs. Presale tickets start at €29 and are available to buy here. ADE runs from the 18th – 22nd of October, head over to their ‘Dave Clarke Presents‘ event on Facebook.